What you see on your updates feed is specific to you and not reflective of what other people in your organisation can see on theirs. It’s a real-time list of things that are happening in Initiatives that you have visibility of. You can interact with your updates feed by clicking the blue links; these will take you to the Initiative area that specific updates have happened in. 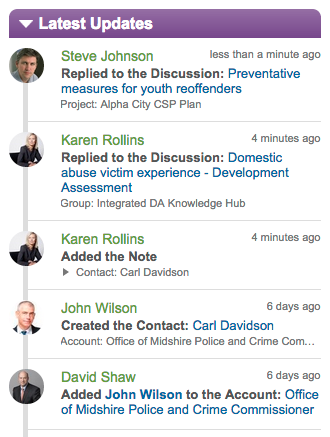 For example, if you were to click ‘Preventative measures for youth reoffenders‘ as seen in the picture to the left, you’d be taken to that Discussion. If you were to click the smallprint below it, you’d be taken to the Project that Discussion was held in.